This will probably come as no great surprise to people who have followed my writing, but I absolutely love ridiculous rap music. Label it as trap, gangster, or straight-up ego overload set to music, I don’t care what it is called as long as the bass hits hard and the lyrics ooze a sense of confidence that likens whoever is delivering the verse to a deity (or better). I want to close my eyes and picture myself surrounded by my closest friends at the greatest party imaginable while fulfilling every goal I have set for myself, and I want it set to music that is almost always made entirely from computers. This is a great departure from my early days in music and writing, which were filled with critiques of bands whose music could generally be described as ‘emo,’ and it’s not a realization about myself I embraced all that easily. There is something about that last line that bothers me more than I can explain. I was aware of my interest in ludicrous hip-hop long before I publicly recognized it and why? So a bunch of people whose approval I long sought would think I was cool enough to one day hire? I don’t know if that’s the exact reason, but I know it was something along those lines. Acceptance meant the world to me, and I am not referring to the band. I wanted to be liked, and for the longest time the people I felt closest to were those who loved the same music as me. When my interests began to change, I started to worry that everyone’s opinions of me would change as well. Fortunately for me, at some point along the line I hit a wall where I could no longer find a reason to care whether or not people I never really interacted with on that personal of a level thought I was ‘cool’ or otherwise interesting because of the music I listened to. The dam I had built in my mind to contain all the thoughts and experiences I had tied to songs I thought I should be ashamed of burst, and not long after I could not help writing about my once dubbed ‘guilty pleasure’ interests. 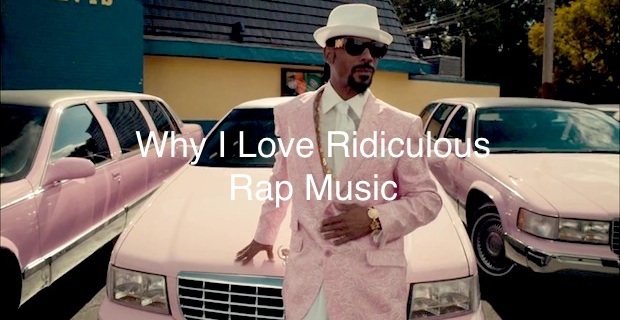 You want to know why I love ridiculous rap? Because I have spent so many years wrapped up in music that deals with heartache and hard living that every now and then I just want to put on headphones and escape. I want to drown out all the pain people feel and connect over so that I can spend a few moments celebrating all the good that is in life. I don’t really drink and I certainly don’t use phrase like “turnt up” in my daily life, but I like to have a good time and tracks glorifying these activities make for a fitting soundtrack. Further, I like to feel good about myself, and no genre of music can help you do that quite like hip-hop. If you have never gotten ready for the day blasting Drake’s “Worst Behavior” then you have never properly prepared yourself to face the world outside. As soon as Drake shouts “Worst” and the beat drops you feel this surge of energy shoot through your core and rattle whatever remaining desire to sleep my have latched onto your bones. Your actions sync to the hypnotic production, and before you start rinsing you find yourself chanting “Motherfuckas never loved us” to a foggy shower curtain. By the time you’re putting on your shoes there is not a force in the world that can stop you. The world is cold, and Drake helped you face that realization with fury and a sense of superiority over your surroundings that can only come from this area of music. It’s not all about conquering the world though, and like I said above sometimes all I want to do is have a good time. My week is filled with stress and anxiety, so when the weekend comes (or the 5 o’clock hour) I like to shake off whatever ails me with songs that bring to mind the elaborate party scenarios in music videos from the 90s. I don’t go to clubs and I have never even considered drinking ‘lean’ in my life, but I wholeheartedly believe tracks like Young Thug’s “2 Cups Stuffed” pack enough inherent fun into their production that the track itself possesses the ability to spark party flash mobs wherever it is played. When it plays want scream “Uno! Dos! Cups stuffed! UNO! DOS! CUPS STUFFED!” until your throat is raw and you have no idea why. In fact, nobody knows why these songs go viral when others with similar subject matter are forgotten instantly, though I am sure some have hypothesized a theory or two, but something in the chemistry between the production team and artist cliques so well it grabs anyone who crosses its path and compels them to look at the world – at least for a brief moment – as if they are on top of it all. I wasted a lot of time writing and talking about music by not being honest with myself and exploring my interests. Rock will always be my home in this industry, and to be honest I could never see myself working full-time in the world of hip-hop, but by embracing a side of myself I thought others could never accept I became a happier person. I cannot claim the same will work for you, but I don’t see how exploring the wide variety of genres the world has to offer is going to hurt anyone. Find what you love and share it with the world. If the first people you encounter do not get it, move on to the next. It’s okay to have a good time, especially when it comes to art. Don’t let anyone tell you otherwise. I was talking about this with a guy at work. I compared it to going to see a movie. You don’t want to watch a movie that plays out your exact life, you want something different where you can escape somewhere else and forget about your life for a while… and rap music is the epitome of not my life. haha. Glad you enjoyed it! I think your description is pretty perfect (a little jealous I did not think of it myself). What songs do you like to spin when escaping? I haven’t found a single artist lately that I have really gotten into… but the good thing about hiphop is there is constantly new stuff coming out. You can listen to an album once or twice and find something new. On my phone currently I have 213, Dizzee Rascal, Dr Dre, Drake, Joey Bada$$, Kanye, lil Wayne, MGK, Notorious BIG, N.W.A, Slaughterhouse (and albums from the dif members)… yea… all kinds of stuff. I can always fall back on some Flatbush Zombies or Mac Miller. Love me some Mac Miller… Currently Mac Miller is one of the two stickers I have on the back of my car (along with The Wonder Years).